This book takes a theoretical enterprise in Christian philosophy of religion and applies it to Buddhism, thus defending Buddhism and presenting it favorably in comparison. Chapters explore how the claims of both Christianity and Theravada Buddhism rest on people's experiences, so the question as to which claimants to religious knowledge are right rests on the evidential value of those experiences. The book examines mysticism and ways to understand what goes on in religious experiences, helping us to understand whether it is good grounds for religious belief. The author argues that religious language in both Christian and Buddhist traditions is intelligible as factual discourse, and so reports of mystical experience are true or false. The book contends that those experiences can be fruitfully thought of as perceptual in kind and that they are therefore good prima facie grounds for religious belief, in the absence of defeating conditions. The work goes on to explore Christian and Buddhist testimony and how the likelihood of self-deception, self-delusion, imaginative elaboration and the like constitutes a defeating condition. It is shown that this defeater has less scope for operation in the Buddhist case than in the Christian case, and therefore Theravada Buddhism is better grounded. This work will appeal to students and scholars of philosophy and philosophy of religion, and those interested in the study of religious experience. Illustrations note X, 66 p.
Chapter 1: The Diversity Problem.- Chapter 2: The Cognitivity of Religious Language.- Chapter 3: Religious Experience as Perceptual.- Chapter 4: The Justificatory Force of Religious Experience.- Chapter 5: Buddhist Testimony and Christian Testimony. Mark Owen Webb is Professor of Philosophy and the chairman of the Philosophy Department at Texas Tech University. He received his Ph.D. in Philosophy from Syracuse University in 1991, and a postgraduate diploma in Buddhist Studies from Sunderland University in 2006. 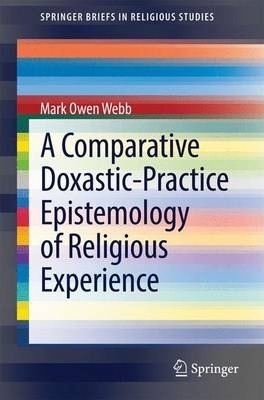 Professor Webb is a specialist in philosophy of religion whose articles have appeared in The Journal of Philosophy, Pacific Philosophical Quarterly, and Religious Studies, among others. His current research is in the epistemology of religious experience, taking into account the individual characteristics of the various religions of the world, and Buddhism in particular. The goal of the research is to understand how, if at all, religious experience can be good evidence for religious belief.